Annual Reports - Nebraska Farm Business Inc.
Each year Nebraska Farm Business Inc. compiles the data from our individual farm analyses and publishes the results into our yearly farm averages books. All of the data included in the analysis is separated into different classes and enterprises to help you compare your farm to the average production numbers of the state and to your specific region. A copy of these reports are offered free of charge to all of our members, state and federal congressional members, and county extension offices. Many banks and lenders purchase these books and use them as a tool to assist them in measuring the financial standing of the operation. These reports can help bankers determine the type and amount of financing that is available to a potential borrower. If you would like a hard copy of our current report please click here or contact us and we will assist you with your order. All of the books available are listed below and can be viewed using Adobe Acrobat Reader. 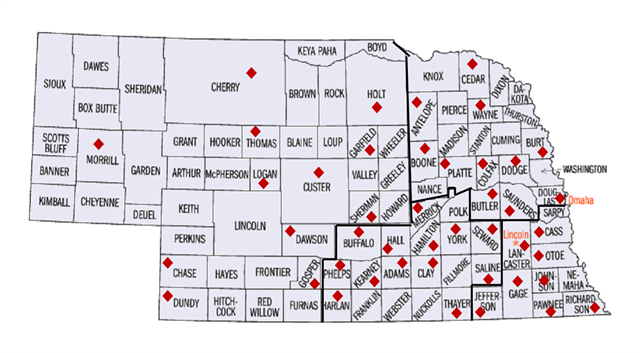 We currently complete analyses for over 50 counties in Nebraska which are represented in the map with a red diamond. We split the state into four separate regions, based on differences in farming practices and the number of operations that we serve within a given region. You can now purchase all of our Annual Reports and Quick Facts using a credit card or a Paypal account using the PayPal secure site. Click here to view our NFBI Annual Report Order Form!! As always, if you have any questions, please contact our office. The 2012-2017 books and quick facts are available for viewing on our website, but are password protected. To obtain a password, please call our office at 402-464-6324.